SciFoo is a conference like no other. It brings together a mad mix from the worlds of science, technology, and other branches of the ineffable Third Culture at the Google campus in Mountain View. Improvised, loose, massively parallel—it's a happening. If you're not overwhelmed by the rush of ideas then you're not paying attention. 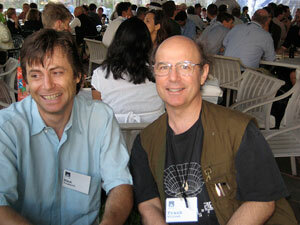 FRANK WILCZEK is considered one of the world's most eminent theoretical physicists. He is known, among other things, for the discovery of asymptotic freedom, the development of quantum chromodynamics, the invention of axions, and the discovery and exploitation of new forms of quantum statistics (anyons). When only 21 years old and a graduate student at Princeton University, in work with David Gross he defined the properties of color gluons, which hold atomic nuclei together. He is the author of Lightness of Being: Mass, Ether, and the Unification of Forces. George Dyson's marvelous Edge post from last year gives a lively sense of SciFoo "organization" and atmospherics. Afterwards, Max Tegmark remarked that this actually packs in an infinity of words! I've long been fascinated by the possibility of emergent (artificial) intelligence, or rather super-intelligence. While we're not quite there yet, at Scifoo it was hard to escape the feeling that a true world-mind is nascent. Computer scientists David Blei and Chris Wiggins advertised a session entitled "teaching a computer all of science". The title turned out to be a little joke; what they've done is fed a big chunk of the journal Science into a computer, and run sophisticated artificial intelligence programs on that material, to find correlations among the words. At this level, what they've got is a useful tool for scientists and historians. As yet the machines don't actively seek sophisticated connections among the concepts they've discovered—in short, they don't think for themselves. But just having concepts seems a big achievement, as when a baby starts to refer to things in the world with appropriate words, if not sentences. Game developer Jane McGonical gave a brilliant presentation on the potential of the game-playing world for science, and vice versa. She points out that Wikipedia was created in approximately 108 person-hours, which is equivalent to 5 days of World of Warcraft gaming (or 1 season of American Idol voting). She says that gamers are a resource available for creative use at any task that can be reformulated as play (which covers a lot of ground!). Astronomers have led the way in citizen science, as in the recent Galaxy Zoo project and the classic [email protected], but McGonical envisions much more. She also wants scientists to solve society's big problems by gaming out future world-scenarios at superstructgame.org. Looks like heavy fun. For anyone who wants to try their hand at building organs for the world-mind, there's now an excellent, ground-up practical introduction to the toolset: Programming Collective Intelligence by Toby Segaran. I'm getting seduced, myself. There seems to be consensus, among age researchers, that understanding and controlling the ageing process is the problem of applied biology. They would think that, of course (especially if they're of a certain age ... ), but there's a strong objective case for it. As Aubrey de Grey and Tom Kirkwood both emphasized, curing any discrete disease (even such a big one as cancer) will make only a modest contribution to extending life expectancy (two to three years). Senescence—the general deterioration of vitality and resistance to adversity with advancing age—is the real culprit. Why does it occur? What are the prospects for slowing it? There is a plausible evolutionary explanation, emphasized by Kirkwood. In the wild, animals do not get old—they fall victim to predators, parasites, or nasty accidents prior to senescence. Evolution favors getting in as much reproduction as possible, so it favors maximizing vitality and reproductive power during the lifespan as naturally limited by predators, parasites, and accidents. Repairs or investment in reserves that would pay off later than that are never undertaken, and senescence is the consequence. If that's right—and there's considerable evidence that in essence it is—then senescence is likely to be a multifaceted complex of problems. But modern biology is powerful, and both Kirkwood and de Grey—though their short-term expectations are wildly different—argue that the time is ripe for a serious assault on those problems. For their respective takes, see Kirkwood and The End of Aging (de Grey and Rae). Given the profound importance of the problem, and the amount spent on what after all amount to relative stopgaps (e.g., curing cancer! ), it's hard to resist the argument that much more money and effort should be going into ageing research. (An interesting specific: One way to defer senescence is well established for many animals, ranging from yeast and simple worms to mice. It is semi-starvation, also known as caloric restriction. It can make really big changes in life expectancy—a factor of two is not unheard of. Kirkwood, however, is not optimistic that it will work for humans. What seems to happen, in response to caloric restriction, is that the organism switches to a state where less metabolic energy is invested in reproduction, and more in repair. That makes evolutionary sense: in hard times, you hunker down and wait for conditions to improve, both for yourself and for your potential offspring. Normally reproductive activity is a heavy burden on mouse metabolism, so relieving it can free up significant resources. For humans, however, the burden is light. Paul Stamets is—quoting Michael Pollan—"a visionary emissary from the fungus kingdom to our world". He sees mushrooms as a replacement for chemical pesticides, a natural filter of toxins, and underground network ("nature's Internet") over which information flows—a primitive world-brain with vast growth potential. He also markets caps made from them. We took home a copy of his fascinating, lavish book Mycelium Running: How Mushrooms Can Help Save the World, which I've been enjoying immensely. (If you've ever had trouble with carpenter ants, you'll savor the Schadenfreude of Chapter 8.) For a free taste of Stamets, check out http://www.youtube.com/watch?v=BelfLIJErek. Former astronaut Ed Lu, now a Google employee, gave a superb talk about earth-impacting asteroids. One killed off the dinosaurs, and another could have our number. Besides the rare ultra-catastrophic collision, there are much more frequent collisions that deliver punches comparable to or larger than nuclear weapons—famous ones produced Meteor Crater Arizona about 50,000 years ago and the Tunguska event in 1908. Today people are gearing up to census the potentially dangerous objects, and thinking seriously about how to divert them. Small asteroids are irregular, loosely bound clouds of rubble, not solid rocks, which complicates matters considerably. You can learn more, and perhaps choose to advance the cause, by following links from http://en.wikipedia.org/wiki/B612 Foundation. Besides that talk about space rocks, there was a screening of In the Shadow of the Moon—a 2007 documentary about how space rocks, or rather about how the U. S. space program rocked in the 60s and 70s (hosted by David Sington, the director). It features original footage, together with interviews of the surviving Apollo astronauts. The movie is affecting on many levels: as the story of a triumphal adventure, as a portrait of unlikely young heros in their later years, as a memorial of an America familiar and yet startlingly different. I laughed, I cried, I thought. In the Shadow of the Moon is now available as a DVD, and highly recommended. I organized this hour. Brian Cox, a charismatic experimenter in high energy physics who is also a well-known BBC presenter, described the Large Hadron Collider (LHC) itself. It's our civilization's answer to the Pyramids of Egypt. But better: it's a monument to curiosity, not superstition, and it's grand scale reflects the greatness of the questions it addresses, not the vanity of its overseers. Then I discussed the issues at stake—cosmic superconductivity, unified field theory, supersymmetry— directions in which our present laws of physics beg to be improved and unified. The LHC will (finally!) give decisive verdicts about those ideas. Turning from the very small to the very large, Max Tegmark gave us a visual tour of the Universe using http://qso.lanl.gov/pictures/Pictures.html. The Universe is pretty big, but fortunately the speed of thought is faster than the speed of light, so we got around pretty well! Martin Rees capped it off by explaining why many of us believe that the known Universe may be only a speck within a much larger Multiverse. Our understanding of these (superficially) vastly different domains—absurdly small and ridiculously large; concrete and experimental, theoretical and speculative—is, amazingly, all of a piece. The basic laws studied at LHC tell us how the Big Bang worked. And together they encode the emerging multiverse that emerges, including its mysterious dark matter and dark energy. We've made dramatic progress, and the best is yet to come: it's an exciting time to be a physicist. 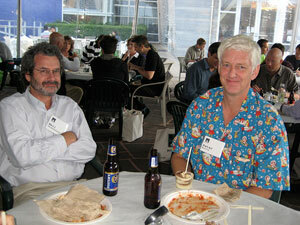 What struck me most about SciFoo was the articulateness and passion of the young scientists there. Listening to and chatting with them it was clear that worries about the end of science are 180 degrees wide of the mark. I found myself wondering how much good it would have done me as a postdoc to have gone to something like SciFoo and met and hung out with my peers from other fields-and just to ask the question is to realize how rapidly the world has changed. I really commend Nature, Google and O'Reilly for getting ahead of the curve and acting to put themselves at the hub of a community of scientists on the forefront of their fields. This time there were a lot more physicists in the mix, but I mostly went to sessions of people and subjects new to me. While there was again a fair amount of systems biology, what I enjoyed most this time was reports of old fashion biology of critters, such as the comparative anatomist Joy Reidenberg on dissecting the larynx of a whale to find out how they sing, and Bernie Kraus's bio-acoustic soundscapes. I finally began to get the point being argued by many young people there about the importance of open source contexts for communicating science. My first response had been to wonder why anyone would want to post their working notebooks and raw data online for all to see, now I begin to get their vision of science done completely in the open. Another thing that struck me was just how good some of the graphics in the presentations are and how essential this is to the work being done. What got to me most was the presentations by several wise elders who talked about the urgency of the global warming crisis. The presentations of Bill Calvin, Steve Schneider and Don Schrag were downright scary in their conviction that catastrophe is very possible. The most insightful comment I heard at the whole meeting was Danny Hillis pointing out that even if there was worldwide political will to do what was necessary to stem global warming, the scientists do not yet have a consensus on what measures to prescribe. So there is serious work to be done here. But my overall favorite scifoo moment was when I chanced to drop in on a session on the evolution of music where I got to see Aniruddh Patel's work with the dancing cockatoo Snowball. SCIFOO SESSION ABOUT "SCIENCE 2.0"
My plan to have webfolk give "lightning" talks for scientists ended up in the schedule as 9:30 a.m. "lighting" talks. Nevahtheless, as Katherine Hepburn would say, an overflow SciFoo crowd showed up in Google's "Damascus" room (seats 22) to hear Tim O'Reilly's own explanation of Web 2.0, followed by stellar short talks by Esther Dyson (EDventure), Chris Anderson (Wired), Barend Mons (WikiProfessional), and Victoria Stodden (Harvard's Berkman Center). Science Outreach 2.0? I see proposed sessions to have science "heard" by politicians (Eric W, Adam Wishart), to get more young people to fall in love with science (Chris Riley), and to get non-scientists involved in "spectator science" or "citizen science" activities (Margaret Wertheim, Jack Stilgoe, Karen James, Brother Guy). Web 2.0 tools (blogs, wikis, social networks, web services) are great ways to reach out to non-scientists. What I'm proposing is a session on this useful subset of HOW-TO (a fairly new set of useful tools), a session where Sci Foo's webfolk (and web-savvy scientists) might give "lightning" talks about "Here is a great web tool useful for scientists doing outreach, here is a quick demo of how it works, here is a URL where you can learn more about it." Tim also recommends "Howtoons" for kids, especially their "infamous marshmallow shooter." 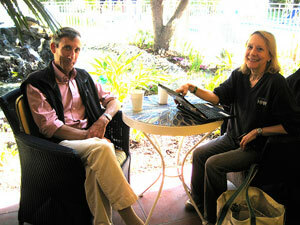 Epernicus.com: Science networking site, mentioned by Esther Dyson. 23andMe.com: User-friendly online DNA comparison tools, explained by Esther Dyson. BookTour.com: Science authors can get book-tour information out to the "long tail", explained by Chris Anderson (Wired). Wikiprofessional.org: Wiki-like tool for Medline that combines language tools and authoritative sources with user input, explained by Barend Mons. Victoria Stodden discussed the misfit between what copyright does and what scientists want to have happen to content they put online. To come, I hope, a link to the web-based license that solves these issues. GalaxyZoo.org: Collaboration inspiration, or how people showed up from all over the internet to help Oxford astrophysicists classify millions of computer-photographed galaxies, and a Dutch teacher named Hanny discovered a unique new astronomy object, not explained by Betsy Devine, though I would have done so if we had time at the end of the session. At the Wild Palms Hotel, note the wild palm attacking George here. In one of the final sessions of SciFoo 2008, Kevin Kelly asked his audience whether we thought the days of individual researchers capturing large nuggets of new insight are over, now that large teams assisted by massive computational resources are plowing the frontiers of knowledge ahead of any single one of us. "So it's not the end of science, but the dregs of science," was the closing comment by Danny Hillis, capturing the spirit of good-natured, no-holds-barred questioning of assumptions that permeated SciFoo 2008. For two days, some 200-plus individuals spontaneously subdivided into roughly 150 sessions covering almost every conceivable topic under the sun (including multiple approaches to solar energy, what to with it, how, and when). 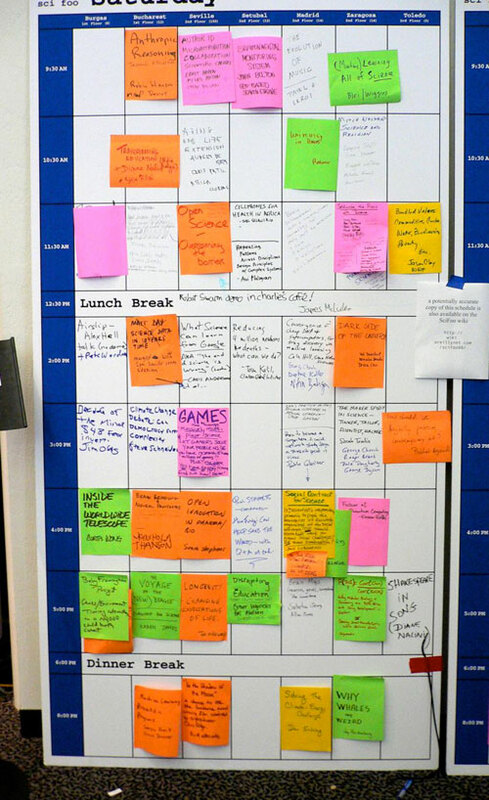 Most sessions were well attended, many to overflowing, and, despite the lure of freely available refreshments, few people were to be found mingling in the common areas—there were just too many interesting presentations and discussions going on (see photographs of the schedule boards to get some idea). There were Google people (including Sergey Brin, Larry Page, and Eric Schmidt) at most sessions, affirming that even when all data are on the network, there is still nothing like sharing insights firsthand. Biology (in all flavors), technology, physics, chemistry, astronomy, natural history, social science, and of course some futurology were all well represented, along with areas in between. I could not detect any unifying theme, except the obvious question of how to do science in the age of super-abundant data (answer: pretty much same as we have always done science, but in larger collaborative groups and with rapidly-improving tools). This may be skewed by my choice of the sessions I attended, but I sensed a broad-based realization that Earth now has a pretty good first approximation of a nervous system, but our metabolism needs some work—starting with a shift in the diet of our machines. Nature/O'Reilly/Google seem to have tuned the mix of old-timers and newcomers just right. There were people and ideas you knew of as well as people and ideas you had never heard of at every turn. To borrow some oddly-appropriate neologisms from Neal Stephenson (who was in attendance) it felt as if Google had gathered a scattered tribe of the Avout into their Math for an all-too-brief Apert.